The official start date for the new story is July 7th! The new strips will be in full-color and feature Prince's consorts. (Long time fans might guess that from the teaser illustration). Tell your friends — also tweet, blog, email, etc. the news. I am happy to announce that new strips will be coming in early July! Check back here next week for more details. For now, enjoy the preview illustration by Falkurneeze, the artist on the new story. The site has been down for a day or so for reasons that should be familiar to anyone following recent news about the problems at a well-known cloud computing service (which shall remain nameless). Some good news. I may have found an artist to continue the strip. Cross your fingers! Still looking for an artist. If you are an artist or know an artist that would be interested in illustrating a webcomic, please contact me. I have some good news and some not-so-good news. The good news is that I have finished the plot for the second Inherit the Earth webcomic story. The not-so-good news is that the artist I was talking to about illustrating the strip has bowed-out. I'm putting out the "Help Wanted" sign: If you are an artist or know an artist that would be interested in illustrating a webcomic, please contact me. We at Wyrmkeep Entertainment would like to wish you a Happy Holiday Season. And so we have come to the end of the story of Little Wolf Lost. Allison and I hope you have enjoyed the tale. Sometime soon a new story will be starting featuring some of the other characters from the world of Inherit the Earth. Check back here or at the Wyrmkeep Entertainment website for updates. Our RSS feeds are also a source of updates. The story is almost done. We hope everyone is enjoying the wrap-up. Notice: Our offices will be closed from August 29 to September 13. Any physical items, like comics, ordered during this period will not be shipped until after September 13. New comic strips will appear during this period, though. The archives page has been updated to indicate that the story of Little Wolf Lost has entered its epilogue. Also, the synopsis found on the prior strip pages now covers the story up to strip 234. Allison is out-of-state for a few days, so she couldn't complete a strip for this week. Conveniently, one of our readers Falkurneeze recently sent me a humorous one-page comic about the Forrest King (seen in strip #246) and his hall. The artist is a previous winner is our fan art contest. I was absorbed by a new project last week and failed to notice that strip 250 had been posted. Yikes! I and Allison would like to again thank all our readers for your continuing patronage and hope you enjoy the wrap-up to the story of Little Wolf Lost. Sometimes a character planned as a minor player in the story grows over time to be worthy of greater mention. 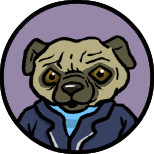 Such is Willis the Pug, who has been added the cast of characters page. Wyrmkeep Entertainment has a table in the Dealer’s Room at Califur (Irvine, CA, June 4-6), where you can buy Inherit the Earth items: game, comic books, music, etc. Come by and say "Hi!" I'm not normally an early adopter. I usually wait awhile before I buy some new fangled gadget. In the case of the iPad, fate intervened: I won one from GameSpy, one of the companies that was exhibiting at this years Game Developers Conference. You can read about it here. 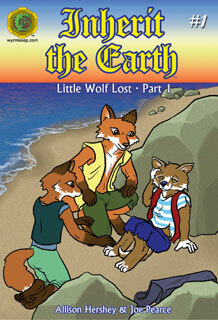 Can a version of the Little Wolf Lost comic books for the iPad be far behind? Still very busy, but I managed to squeeze in some time to draw two panels of crowd scenes. It's hard to do crowd scenes in a hurry! I could probably tweek the art a bit, especially in panel two, but that will have to wait awhile. Hope everybody had a happy spring holiday! I had a very busy week last week, with a Hollywood premiere, a family reunion, meetings with the tax accountant (in Los Angeles!) and 900 miles of driving. This week there are Passover and Easter preparations, work with the local emergency response network, and more family stuff. In other words, I'm swamped. This week's strip will have to wait. I'm hoping to find enough time in the wee hours to get it done by next week, but it's going to be tight. I'm hoping you readers can bear with me, and accept my apologies for the break in the schedule. I am currently in the process of moving all the Wyrmkeep Entertainment websites to a new server. It is possible that there might be intermittent outages during the next couple of weeks. Ahead of that, I am making some (hopefully) minor changes to this website. If you find any bad links, please send me a comment about the problem. I would like to thank our current sponsor, Dream Fathom, and remind everyone that one way you can help support this site is by placing an ad. Sales at the Wyrmkeep Entertainment Cafepress shop have been sub-par for the last year or so, and the fees to keep the shop open are higher than the income being generated. Reluctantly, I have decided to shut the shop down. Questions about the shutdown should be sent to me via the comment page. This will have no effect on the items we sell directly like software, comic books, music CDs, etc. I and Allison would like to offer all our readers a Merry Holiday Season! My dog, Winnie, has been experiencing increasing paralysis in her hind legs. X-rays at the local vet showed compression of several vertebrae, causing possible disc and nerve damage. In order to find out what was happening with the soft tissue, I had to take Winnie to the U.C. Davis small animal veterinary clinic last week to get an MRI. The tests and procedures stretched out to several days, and since it was several hours drive from my home, I stayed at a nearby hotel during that time. If they pinpointed the problem and it was operable, they were going to perform back surgery on Winnie that Friday. Unfortunately, the MRI was inconclusive. There was what appeared to be thinning of the spinal cord, but they couldn't pinpoint the cause, and therefore felt the surgical risk was too great at that time. Because of the holidays, further tests have been postponed until January or February. At this point I have to weigh the costs and surgical risks against my bank account plus Winnie's age and quality of life. Costs have topped $3000. 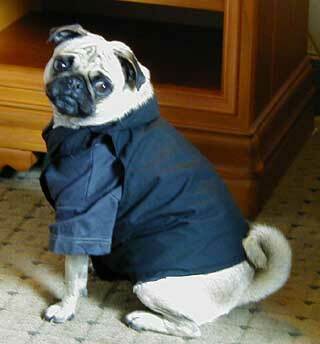 Winnie is 9 years old, and Pugs tend to live 12 to 15 years. More from Joe: Allison didn't want to miss two weeks of updates, but she only had time to create this heart-felt filler strip. She wants me to thank everyone who donated to help Winnie! There will not be a strip update this week. Allison’s pet Pug, Winnie, is sick; and she needs to deal with trips to the vet, etc. Also, you should go see the movie Fantastic Mr. Fox. 'Nuff said. Inherit the Earth is now on Facebook! Suggestions on what to do with the group are welcome – I'm a Facebook novice myself. Your can send comments directly to me, via the Wyrmkeep Entertainment forum, or at the Facebook group itself. The file server that hosts the various Wyrmkeep Entertainment websites went down late Tuesday. This was at an inconvenient time as no one was available to reset the system for over a day. Sigh. We're back now. I am currently working on a re-release of the German language version of Inherit the Earth: Quest for the Orb. Although almost all the game text and audio is translated, various text strings in the installer, uninstaller, etc. are not. Anyone interested in doing the translations? You will need to have a good knowledge of current German computer software terminology. Send me an email via the Comments page if you would like to give it a shot. I've been a little behind in updating the story summary that can be found on the prior strip pages. The summary is now up-to-date (or as up-to-date as I want it to be). In collaboration with iPhSoft, Inherit the Earth: Quest for the Orb is now available for iPhone and iPod Touch! Visit the publisher's website to order the game. After a week in Montreal and a nasty case of poison oak, I'm back at work. Gotta be careful to keep my oozing arms off the Wacom tablet. And the itch... I'd never wish it on my worst enemy! Allison has informed me that she will not be able to provide new strips for the next two weeks. I guess Rif and Sandy will get some time to appreciate the captain's cabin. I will be attending Worldcon in Montréal next week. Here are the list of the panels I will be on. Your best chance of finding me at the con (to say 'Hi!' or whatever) would be at one of these panels. The last item is actually a "talk" where I will be giving a short overview of how game development works... or should work... There will be a Q&A session too. Allison will also be Worldcon, but she will be stuck behind a table at site-selection. You can try visiting her there. On another topic, my scanner is not working so there won't be any classic sketch updates until after I return from Worldcon. Allison has created character portraits for both the captain and first mate of The Black Raccoon. Those images and character descriptions can be found on the Characters page. Avast, matey! We've reached strip 200! Even though it's not Talk Like a Pirate Day, I thought a nautically-themed blog title would be appropriate as we find our protagonists on the pirate ship, The Black Raccoon, as we arrive at strip 200! Comments welcome. Issue #2 of the Inherit the Earth comic book is back from the printer and is available for purchase! Also with the release of the second comic, we have renumbered the parts of the story on the archive page to 1, 2A, 2B and 3. Issue #2 of the Inherit the Earth comic book is off to the printer and should be available in time for us to sell at this year’s Califur. It will be available to purchase on our websites the first week of June. I should probably tell you our upcoming convention schedule, too. The dates are those days we will be in the Dealer’s Room selling Inherit the Earth stuff. I was out of town a couple of weeks on personal business. Hopefully we are back on schedule now. Allison will not be able to post a new strip this week. There will be a new classic sketch on Friday though. Don’t worry — Allison isn’t leaving. This is for a future project. Some details for those who didn't attend that con: Issue #2 will be double-sized and sell for $5.99 plus shipping. It will include what is currently referred to as part 2 and 3 of the story. Four years ago this week, March 22nd to be exact, the first strip in Little Wolf Lost was posted. It is 188 strips later, and both I and Allison hope our readers are continuing to enjoy the story. We can finally announce the second 2008 Fan Art Contest winner: Gaël Orliange for "Tallek Remembering." Gaël previously won in early 2007 for "Yisha." We have selected the fan art winners. The first winner is Falkurneeze with her humorous "Rif the Fox Baron on the New Human Artifact" [view]. We expect to announce a second winner at a later date. The Ursa Major Awards are given to the best anthropomorphic-themed works from the previous year. Nominations for the 2008 awards are now open and will close at the end of February. If you think that Inherit the Earth is deserving of the honor, please consider nominating us for Best Anthropomorphic Comic Strip. There is a new version of Rif's Box-o-Rama available for play. This fixes one bug: high score information was not being properly transmitted to the server. I apologize to everyone who played the game and was unable to immortalize their high score. Wyrmkeep Entertainment will have a table at Further Confusion (Jan 23-25 in San Jose, CA) where you can purchase Inherit the Earth (the game, the comic book, etc.) Allison will be there on Saturday to sign comic books and other slips of paper. Please note that our table will located in the corridor outside the Dealers Room. On a related topic the current Fan Art Contest has been extended until after Further Confusion. You can even drop-off an entry at our table at the con, and we'll scan and post it for you! I'm back from the holidays and ready to get on with the story. Much rested and rejuvenated (I had to recover from the holiday mania, but I'm better now.) I'm getting down to work on the cover of the next issue which will be coming out soon. Stay tuned. Allison had hoped to have a new strip this week, but preparations for driving back to Southern California for Christmas got in the way. She was able to provide a "story-reading" strip as a replacement. I expect this will be the last update for this year, although Allison says she will try to have a strip for next week. Update: Nope, no new strip. See you next year. Everyone here at Wyrmkeep Entertainment hopes you have a Happy Holiday Season! Wyrmkeep Entertainment has released a second web-based game, Rif’s Box-o-Rama. In this game Rif must search through a room of boxes in the Rat Complex to find some human artifacts. Note that this is a Beta release, so there might be some bugs. Also, the game requires Java. Both this new game and our first web-based game, Morph Match, can keep track of high scores. So, give both games a try! The Inherit the Earth Adventurers Guide (the game’s hint book) and Inherit the Earth #1 (the comic strip collection) are now available as PDF documents. Both are formatted to print on common paper sizes (A4 and US Letter). You can purchase a copy here. Both publications are still available in "dead tree" form. A reminder: This year's Fan Art/Fiction contest wraps-up soon. Post your entries here. We will be selecting a new set of winning entries in our continuous fan art/fiction contest at the end of the year. Just post your entries to the Fan Art & Fiction forum. Be sure you read the rules. I wanted to remind our readers that we have a new wallpaper gift for those who decide to support this site by making a Tip to the Authors. The wallpaper (shown below) comes in various sizes for your desktop backdrop pleasure. We are taking a short break from our story, both because it is Allison’s birthday and the story has reached the end of part 3. Allison hopes you enjoy this in-between strip that she whipped-up for today. The intro to Inherit the Earth: Quest for the Orb is now available for viewing as a Quicktime movie. Alternately, you can view the version I uploaded to YouTube. Enjoy. I and Allison's attendance of Worldcon will probably prevent the posting of new content until next Friday, although Allison may still come through with a strip on Tuesday. Update (August 12): Nope. No strip. Classic sketch update on Friday. If you come to a panel and mention you read the comic strip, I will give you a copy of Inherit the Earth #1 (while my supplies last). Allison will also be at the convention, but will not be appearing on any panels. She will still be busy as she is a member of the convention staff. We also have a new wallpaper gift for those who want to help support this site via a contribution. Inherit the Earth: Quest for the Orb is now available as downloadable trial versions for Windows, MacOS X, Linux and PocketPC. The trial versions have expanded game play over the earlier demos, and each can be activated into the full game with a registration key. No CD-ROM required. If you want to play the game via ScummVM, you will need to order the CD-ROM version. 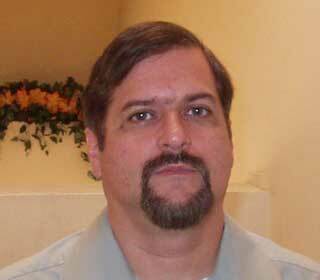 I will be at Westercon in Las Vegas this Independence Day weekend. I'm not on any panels, but if you see me in passing please say "Hi!" There will be a classic sketch update while I'm gone. I am back, finally. Glenn and I had a short honeymoon at Ojai Inn and Spa, just a bit north of Los Angeles, but we had a bit of a scare while we were down there. A wildfire erupted just 3 or 4 miles from our home near Santa Cruz. We were on the phone with a neighbor through the weekend getting updates. Fortunately for us the wind changed and blew away from our house, but 10 people lost their homes on the other side our little mountain. This weekend I took part in a Community Emergency Response Team drill at the local safety fair. While we were practicing, a freak lightning storm passed overhead and started several more fires north and east of us in Santa Clara and Sacramento. Fire crews were still mopping up from a different fire started the day before on Highway 1 in Watsonville, near the site of the safety fair. Quite a few pets and livestock were killed in that fire. This is going to be a long summer. It would sure be nice to have an Orb of Storms to put things back in balance. Comic or Husband - Which to Choose? My husband and I are getting married! Yes, you read that right. Though we legally tied the knot 18 months ago, we weren't able to have our wedding then due to logistical obstacles. We had a little dress-up ceremony in Japan last summer, but friends and family weren't able to attend. The classic walk-down-the-aisle ceremony was postponed again and again until finally all the pieces came together, and the big date is now only a week away. Tonight I'm flying down to the wedding venue in Los Angeles. I'm booked solid through the weekend with wedding preparations, and the rest of the week is filling up fast with appointments and errands. I will only have my laptop with me, and working on that is slow and cumbersome. The upshot is, I don't think I'll have time to get any strips done until I get back home after June 18th. And we're right in the middle of finding out what Rhene did while Rif was searching for the orb! Oh dear. Thanks for your patience, friends. I'll get back to work as soon as I can. In an earlier blog entry I mentioned that a flashback to the game was coming-up in the comic. And lo, it has arrived. For the next few weeks Rhene will present her (limited) view of the events of the game. Enjoy. The Wyrmkeep Entertainment Co. Web Site now features free web-based games! The first game is Morph Match and features art from Inherit the Earth. More games to follow every few months. Please post your comments in the Web-Based Games forum. Also, I will be out-of-town visiting relatives on Friday. So, no classic sketch this week. I thought everyone might like to see the April 1st strip in its original color form. Some changes are afoot here in Inherit the Earth land. First, the site now has a news feed that lists every recently added strip, sketch or blog entry. Click on the News Feed icon ( ) to subscribe to the feed. Second, the classic sketches section of the site will be undergoing some re-organization starting this Friday. A quick reminder: Allison had to replace her computer recently, and you can help her out by making a donation. It appears that Nigerian thing didn't work out for Allison, so she will have a new strip for April 8th. This means the new story I had planned will NOT be continued. I’m sure all our readers will be saddened by this news. I’m not sure why things like this always happen around this time of year! It appears that Allison’s recent computer problems have been too stressful, and she has decided to take a few months off from the strip. She also mentioned something about getting an email from a long lost Nigerian relative who wants to leave her a bunch of money, so she’s going there to collect it. I have decided to start a new story on my own to fill the time. Please enjoy the first strip in this new story. My poor old computer blew up in a great flash of light last week, the 2nd time in less than 6 months. 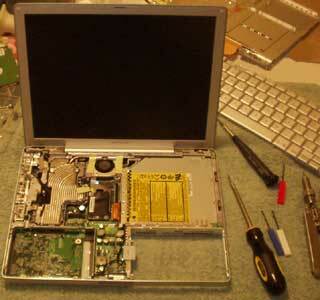 Last time I had to replace a hard-to-find motherboard and power supply. I was told I was lucky to be able to find a motherboard, the computer was so old. This time I decided to "bite the bullet" and buy a new computer. I scraped together enough money to get a discount model from Dell. (Even a bottom-of-the-line computer ought to be leagues ahead of what I was using before.) I received it in the mail today, and I am feverishly reinstalling programs. After I get a few more bits and pieces of equipment I will be able to transfer data from the old hard drive and get back to creating strips. Stay tuned. It was three years (and a couple of days) ago that the first strip of Little Wolf Lost was posted here. We hope you have enjoyed the tale so far! Allison and I would like to congratulate the latest winners of the on-going fan art/story contest. Allester E. Darkflame for "Inherit the Earth: The Return of Humans"
You can win too! Read the contest forum topic for details. Allison has provided updated portraits for Rif, Rhene and Sandy, plus a new portrait of the current villian, Rufi the Otter. Things to Report and Happy New Year! Today's classic sketch is from the archeology section of Inherit the Earth history. Please take a look. Allison visited SoCal during the holidays, and she and I were able to complete the basic plotting for the rest of the current story, "Little Wolf Lost." You might say, "Huh? Don’t you know what the story is?" Well, yes, but some secondary plot elements hadn’t been nailed down yet. This doesn’t mean that the rest of the plot has been broken down into individual strips. We prefer to do that in clumps (chapters in a sense). One of the more interesting, upcoming chapters (at least to me) is a multi-strip flashback to the original game where we will reveal some unseen background action. I hope it will explain a thing or two. Today was the last day to submit fan art/story entries for this year. We will be announcing the winners sometime in January 2008. Also, today's classic sketch is the last update (comic or sketch) until New Years Day. Finally, I and Allison would like to wish everyone a Happy Holiday Season! In convention news we will have a table at Further Confusion (Jan. 25-27 in San Jose, CA). We will have copies of the game, comic book, T-shirt and other wares for sale. A reminder that we will be picking fan art/story winners soon. You should post your entries by December 21st. The computer that is used to perform scans here died a week or so ago, which is why there haven't been any classic sketches posted recently -- this upcoming Friday included. Hopefully things will be resolved by December. Mama Bear has been added to the cast of characters page. We are probably going to select some additional fan art/story winners before the end of the year. So you may want to check the rules and then get your muse working. Inherit the Earth® is now a registered trademark. So, many little R's in circles will be appearing on this site as pages get updated. Some of our forum members have managed to find the teaser page for Inherit the Earth 2. I have decided to come clean and acknowledge the page does exist. When work of the sequel gets more serious, that site will have a development blog to keep our fans up-to-date about the status of the project. Please note the word tentative at the bottom of the teaser. Instead of a classic sketch update, I have produced some additional honorable mentions from the recent Caption Contest. Please take a look. Also, the picture of the poster from last week can be found on the same page as Alicia Austin's cover art scan. Come to a place of unbridled wonder and unspoiled beauty: Earth! To the Morph, Humans live only in legends, but their legacy remains. Accompany Rif, a heroic fox who must journey far from home to uncover the mystery of an ancient, yet powerful human artifact. With thrilling graphics, sounds, story, and an easy-to-use interface, Inherit the Earth will provide hours of challenge and enjoyment for the whole family. I thought about skipping the update today given it being the anniversary of the terrorist attacks six years ago, but a little humor is not a bad thing on a day like today. No accounting for jet lag, though. I am attending Worldcon in Yokohama, Japan this week. So, there will be no classic sketch this week. Allison and her husband are also attending the con. You might think this will cause an additional delay in new strips, but not so. Allison has been drawing new strips during her "break," so she can really take time-off during her vacation in Japan. We have picked two "winners" -- an "out-of-continuity" and "in-continuity" winner. The out-of-continuity winner is from "Catbunny" whose entry will be displayed on the main page until strip #113 is posted next week. The other co-winner is "cairn destop" whose entry we posted on August 7th. His entry will be the final strip #112 and will take that position next week. Congratulations to the winners. We will also be awarding entries as honorable mentions. These entries plus the winners will appear on a permanent 2007 Caption Contest page that will be created sometime soon. We're still considering which caption entry to declare the "winner." We have narrowed it down to two. We are also thinking about honorable mentions. One issue is that we would like the winning entry to either fit into the continuity of the story or be completely out of continuity. Many entries included an off-stage comment by Rif, which doesn't really work in continuity. Oh, well. Here is another entry for the caption contest. Actually, this particular reader sent a number of suggestions — this was the shortest one. I modified the text slightly by dropping the "not" from the first line. Taking a different tact, another reader (Wolfie Inu) decided to translate a earlier strip (#108) into Afrikaans! The Caption Contest continues. Details can be found in the blog entries below. The first entry we received was from "cairn destop," a frequent poster on our forums. It is the only entry (yet) that is totally narration and not thoughts or dialogue (or at least that's how I read it). The entry is an honorable mention... and could still be the winner. The Caption Contest continues. Details can be found in the blog entry below. There is now a forum topic with a discussion about the contest. Summer Break and a Contest! The prior week’s strip (#111) was the last strip of Part 2 of our current story, Little Wolf Lost. Allison has decided to take a few weeks off before continuing on to Part 3, but before doing so she provided an extra strip. This strip has no balloons, because we would like you to provide Sandy’s current thoughts. Yes, it’s a contest! Send us your idea for what is on Sandy’s mind. The best entries will be posted here for everyone’s enjoyment. Alternately, you can pick any earlier strip and provide alternate dialogue. Or, if you are an artist, send us a strip of your own design based on Inherit the Earth (the game or comic strip). Please send in your entry by August 19, as I will be posting the final best entries on August 21. I will also be posting interesting entries in the weeks before to the final date. Please provide your name and email address with your entry. We do want to credit the authors of best entries — you are welcome to provide a pseudonym to use for the credit instead of your real name. There will be no classic sketch update this week as I am off to attend Comic-Con. Below is a version of the contest strip without the notice in the last panel. I had an enjoyable trip to the Bay Area and Pittsburgh. Sales at Anthrocon were fairly brisk, and I had a chance to chat with both Bill Holbrook (Kevin and Kell) and Amber Williams (Dan and Mab's Furry Adventures). But it is good to be back home - even with a slight head cold. The Wyrmkeep Entertainment Co. will have a table an Anthrocon this year, and I will be selling the company’s various Inherit-the-Earth-related products (software, comic book, T-shirts, etc.) The Dealer’s Room at the con will be open July 6-8. Come by, say "Hi," and buy things. 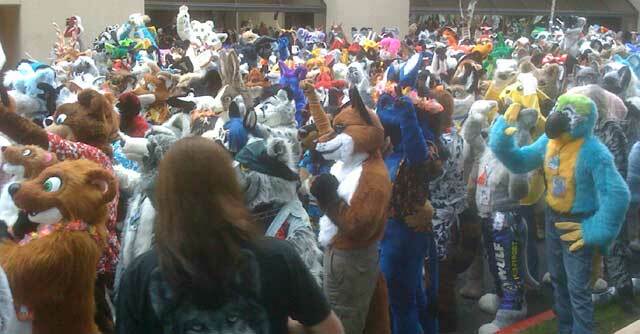 Westercon is the same week as Anthrocon, and I will be attending that con too! Allison is also attending Westercon, so there will be no new strip or sketch the week of July 4th. There will be a new classic sketch this Friday. 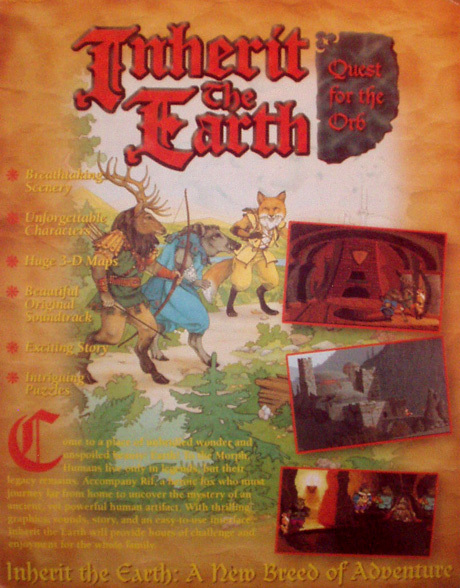 Although not a classic sketch, I thought that some of you might like some background information on the cover art for Inherit the Earth Adventurers Guide. First update: It appears the before Rif was named Rif, he was named Ren. I will be adding a section about the 1992 design document where this tidbit of information appears sometime soon. I don't know if the character was named Ren as far back as this drawing. Second update: I received an email this week from Eric Blumrich, one of tha game's concept artists. He was able to confirm that he was the author of the Orb of Building drawing. The first issue of the Inherit the Earth comic book is now available! You can purchase a copy from this page. Major Milestone - It's Strip #100! The posting of strip #100 is just one of a number of milestones and events of interest in the next few weeks. Before I get to the other items, I and Allison would like to once again thank all our readers for their continuing support in this storytelling endeavor. Inherit the Earth #1, a collection of the first 54 strips in comic book form, is currently being printed and will go on sale next week. Check back then for information on how to order your copy. Finally, The Wyrmkeep Entertainment Co. will have a table at Califur.III, a convention taking place in Costa Mesa, CA from May 4-6. I will be there selling the company’s various Inherit the Earth related products including the comic book. I would like to welcome our new sponsor, the Psi Morphs role-playing game. I encourage you to check out the game's site! You too can sponsor Inherit the Earth. Click the button on the right side of this page to request more info. It looks like there is eventually going to be a lot of Ed Lacabanne's storyboard art appearing in the "classic sketches" section of the site. So, I have moved the storyboards to their own group on the thumbnail page. We're too busy finalizing the first Inherit the Earth comic book to "celebrate" April 1st. Web site mutations from previous years can be found here: 2006 and 2005. If you don't normally look at the classic sketches we post on (most) Fridays, you may want to make an exception and view two previous/a> drawings, as these are the earliest known pieces of concept art for the game. The next older pieces are of a male and female Elk, also drawn by Lisa Sample. For the next few weeks the so-called Tuesday update of the strip will be happening very late on Tuesday. Many of you may find it is already Wednesday when the strip is posted. This schedule will probably continue for a few weeks. I would like to congratulate our latest fan art contest winners: Gaël Orliange and "Rif Fox". You can view their winning entries here. You could be a winner too. Read the contest rules and start drawing, writing, sewing, etc. We are inching forward on our plans to print the first set of strips as a comic book. We are targeting sometime in April as the publishing date. There will be more details as the date looms nearer. Below is a mock-up of the cover to issue #1. This is not the final cover — Allie is adding some clouds. There is also a new wallpaper tip gift. Wyrmkeep Entertainment will have a dealer's table at Further Confusion 2007 in San Jose (January 18 to 22). We will be selling our wares all three days that the dealer's room is open, although we won't actually be in the dealer's room — we will be just outside in the so-called Artists Alley. Allison Hershey will be at the table on Saturday and possibly other days (Friday?). This is the week of Allison's move to Santa Cruz. The move, plus continuing car problems, has left her with no time to do a strip. Sigh. Finally, there will be no classic sketch updates for the next two weeks. Here is a rather long blog entry for those of you who are interested in why there was no update on the strip this week. I wish it was as simple as "my dog ate my homework," but it is rather more involved, and sadder, than that. You see, my car ate my time. It seemed like a good car when I bought it in October. After living 5 months without one (my old Camry was demolished by a hit and run driver), I found a 1998 Subaru Legacy that seemed in very good condition. I paid the local Subaru dealer to check it out before I paid the private party for it. They said it was in good shape, though a little high in the miles. The "check engine" light came on the next day. I went to two different mechanics, neither of whom could find anything wrong. They reset the indicator light. I had the timing belt replaced and a general tune-up, just to be safe, since the previous owner didn't know when she had replaced it before. I also had a leaking steering pump replaced. My mechanic announced the car "in great shape." I was another thousand dollars poorer, but the car ran quite smoothly after that. For about 2 weeks. 10 days ago, as I was preparing for a trip to my future home near Santa Cruz (400 miles from Los Angeles), my car alarm armed itself and couldn't be shut off. I was stranded. I spent several days looking for a place that would even look at it before Christmas. There was only one place in Southern California, a Subaru Dealer 30 miles away in Irvine. I managed to get the car over there, and a week later they had it ready. Though I had asked them only to fix the alarm, they warned me that all kinds of things were wrong with the engine and if I didn't have a major overhaul right away I would be in trouble. I was suspicious, so I retrieved my car and had my regular mechanic look at it. He found nothing seriously wrong, but now the engine was running a little rough and I needed to keep an eye on it. All this calling around and fetching my car (I had to make several trips to Irvine) forced me to put off my regular work, Christmas shopping, packing, and work on the comic strip. But I still had a couple of days left to work on the strip when I got up north. I had a possible job interview waiting when I got up there, too. Saturday afternoon I left for Santa Cruz. It took 45 minutes to get my car to start, the first time it had ever had trouble doing so. I got as far as Burbank, about 30 miles. Then the temperature gauge climbed quickly into the red zone. I pulled over and waited awhile, found it didn't help, and crept about 2 miles to my friend's house nearby. On Monday we took it to her mechanic. He pronounced a blown head gasket, caused by a defective cooling fan. It is a minimum of $1500 to fix. If the engine block was warped (he'd find that out when replacing the head gasket) it would be $5400 for a rebuilt engine. Plus labor. And he wouldn't be able to fix it until after the New Year. It would cost me as much to replace the engine as the car cost me in the first place. And I had borrowed most of my money to buy the car. This time around I am broke, jobless, and have maxed out my credit line. I had someone pick me up and take me back to Long Beach Tuesday afternoon. There went my deadlines, my Christmas shopping, my moving, my potential job. This is my tale of woe. If I wrote all the details it would be twice as long to tell. I could have boiled it down to "I had car trouble all week and now I have no car." But that didn't explain why it took up so much of my time. I'm working hard now to catch up, and will do my best to have a strip ready next Tuesday. Note from Joe: Thanks to all of you that donated! The middle two panels of today's strip may seem a little odd to those of our readers that haven't played the Inherit the Earth computer game. The screenshot below may help explain the bit of whimsy in this strip. At this point in the game Rif is talking to the Forest King, and the player has to make the choice of what to do next. One of our favorite charities is Child's Play, an organization that donates toys, games, books and cash for sick kids in children's hospitals across North America and other countries. Their 2006 donation drive has just started, and you can learn more by clicking the banner below. Lots of upheaval behind the scenes this month. My fiance and I are moving 400 miles away to Santa Cruz. Actually, my fiance (Glenn) is moving at the end of this week. And all my stuff (computer excluded) will be moving too. I will go up for the weekend, but come back to the Los Angeles area to camp out until the end of December. After that, Joe and I will be collaborating long distance. It's going to be quite a feat to complete a strip this week while packing and directing movers, driving, and sorting things as they come out of the truck on the other end. No sleep for me, I'm afraid. Today's classic sketch is a black-and-white version of a color sketch of the Dog Castle we posted in April. See this updated page for additional details. Ahoy, here is today's strip ready for the high seas. Aye, me parrot concurs. I have been upgrading my artist tools lately. I've recently acquired Photoshop CS2. It works a little differently than my old version and will take some getting used to. But there is greater flexibility and a lot of neat new tools to work with. My friends and family pitched in and ordered me a brand new (and larger) Wacom digital drawing tablet for my birthday. I also received a 19 inch flat screen monitor from a very generous colleague. It's going to be a real pleasure to work on the comic strip now. Oh yes, one other useful present. Joe gave me Scott McCloud's new book, Making Comics. It's about time I learned how to draw them. This time around I will be responcible for a late strip. I'm off to Austin, Texas for a game conference, so posting a new strip will be basd on my free time while there. Update 1: Strip is up, although the sepia toning is off -- GIMP vs. Photoshop again. This will be fixed when I return from Austin. Update 2: Back from Austin. The strip has been color-corrected. Also, I'm sorry there has been no new classic sketches for the last two weeks. There will definitely be one next Friday. The posting of strip #68 will be delayed a day or two while Allie recovers from helping to run L.A.Con IV, this year's World Science Fiction Convention. Update from Allison: Here it is. cough cough. sniff. Fall over. The new Inherit the Earth Fan Art/Fiction forum is now open. You are welcome to post your art and stories based on the game or the comic, although you should follow the guidelines found in the "Welcome" post in the forum. There is a second purpose for this new forum -- it is the repository for entries in an ongoing Fan Art contest. Rules can be found in the aforementioned post. For the next few weeks the classic sketches will almost exclusively be related to the Dog tribe. We will also be revealing some previously unpublished information about the various Dog characters that appeared in the original game. Last week we revealed that the name of the Poodle from Prince's "harem" is Annabelle. That name comes from the original design document written in 1993. We have returned to our regularly scheduled story and artist. Allison and I would once again like to thank J.L. Anderson for her work on the "Okk and Eeah Show" strips. The logistics problem with the guest strips have been resolved. The strips have been reordered so all the guest strips will be together. Sorry for the confusion. I and Allison will be attending Conzilla (this year's Westercon) in San Diego over the July 4th weekend. We will be appearing on a number of panels -- even one together! Our schedules are listed in this announcement in the forums. Or if you see either of us wandering around the con, please stop and say Hi! Scary 6/6/06 Day - Boo! First, status report: This and next week's strips are in the "standard" continuity. Those will then be followed by the guest strips. 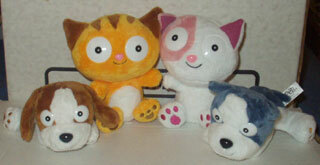 Second, we and GoPets are donating the following item to the Anthrocon charity auction: four plushies and a 3 month premium subscription to the GoPets virtual pet community game. I would like to introduce J.L. Anderson (www.anaria.net), who will be our guest artist for the next few weeks. Allision will be using the time to draw the cover to the first Inherit the Earth comic book, which will collect all the strips up to #54. We also have decided on the title for the current story: Little Wolf Lost. Wyrmkeep Entertainment will have a dealer's table at Califur (May 5-7 in Costa Mesa, CA). I will be there all weekend, while Allison will be there only on Saturday. Please come by and say "Hi!" I'm back from Korea where I was visiting the offices of GoPets, a company that publishes an online, multi-user virtual pet game. Wyrmkeep Entertainment does consulting work for GoPets, so occationally I need to "sync-up" by being there in person. Also, the last two strips have been re-processed to get the sepia toning right. We have resolved the problem the website was having yesterday. It appears that the Flux Capacitor module of the web server was overheating. It's amazing how a few good whacks with a big wrench will fix a Flux Capacitor. One unfortunate side-effect is that there is no new classic sketch -- check back on April 7th. I am seeking suggestions for who or what should be the subject of the next donation gift wallpaper. You can send your idea through the comment page or email it to techsupport@wyrmkeep.com. Update - Switched to Photoshop version - compare the results here. Who's Talking Now: Posts here will now indicate whether Joe or Allison is speaking. Strip Number: For those who want to comment on or (harangue about) a particular strip, the number of each strip is now displayed at the bottom of the page. Recently a draft of the manual was discovered in our archives, which can be used to determine what parts of the manual were written by The Dreamers Guild and so reprintable by us. So, I am happy to say that the original text Prologue to the game is now available for your perusal in the Archives page. Allison battled through her cold and produced this week's strip just a little late. Update: I have changed Rif's reply to Sandy in panel one to show that their conflict from the prior strip has not been resolved. Allison Hershey, the artist behind the comic strip, will be attending the cons (although only confirmed for the Saturday at both events). Below are thumbnails of some of the prints we'll be selling. They should be available for purchase online in February. And Happy New Inherit the Earth Web Site!! We asked Bradley W. Schenck, the designer of The Labyrinth of Time, to provide a new look for the site. We think it's quite nice. We are providing links to a couple of good causes for this holiday season. The first is Child's Play, a charity which provides video games and consoles to childrens hospitals in the US, Canada and the UK. The second is a link to a site that lists organizations that help to find good homes for sick, injured and abused Pug Dogs. One pug that already has a good home is Winnie, Allison's dog. Please visit our table at in the Dealer's Room. We will have some special items that we will only be selling at these conventions. September is the 3rd Anniversary of The Wyrmkeep Entertainment Co., and we've decided to have some special events this month. One such event is a Fan Art Contest. We will be awarding prizes in four categories, two of which involve art based on Inherit the Earth. Click the link to read the contest rules. There will be no new strips for a few weeks while we are on vacation. The next new strip will probably appear on August 23. Also, new sketches will not be posted for a few weeks after this Friday's illustration. - 8/5 Friday 11:00am Game Design: You've Read It, Could You Play It? We would like to thank everyone who visited our table at Califur.1. It was good to hear from those that were already following the strip, and we enjoyed spreading the word to both existing fans of the original game and others who discovered Inherit the Earth for the first time. We would also like to thank Robert McNally, one of the co-designers of the game, for helping out on Friday. This is the first strip where a location from the original game is revisited. As a lark Allison decided to use the same point-of-view of the ferret village as in the game (see screenshot). After Friday's sojourn into a pitiful, alternate universe, we now return to our regularly-scheduled universe. Today we present the introductory comic strip in a new serialized story that takes place in the lands first introduced in the computer game Inherit the Earth: Quest for the Orb. In the following weeks we will acquaint you with Rif the Fox and his companion Rhene, their fellow Morph -- some old friends, others new -- and an emerging threat to their society.